Hello, I added the "All Cities and States" widget to my form, however, I'd like for it to only display cities/states for the United States. So I input "United States" in the box that says: "Countries to show". However, when I preview the form, it still displays all the countries and the user needs to click the drop-down box and select the United States first. Is there a way to make it show only the United States, and make it so that no selection is needed, it just auto-selects the United States so that the user only needs to select the city and state? Thanks for your help. It seems that there is an issue with the widget. I am able to replicate the issue at my end. Let me forward the issue to our backend team to take a look. If there is any update in this regard, you'll be posted here. Let me also see if I get any workaround to display only US in the list. I'll let you know in this thread if I get any information with this. 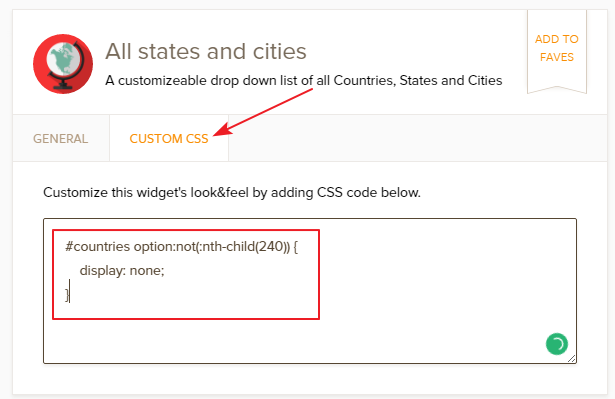 Please inject the following code to the Custom CSS section of the widget so that only US will be displayed. We've fixed the country filter setting. Please try it again and let us know. Since it is a old thread, we have moved your query to a separate thread and address it there shortly.